Dalmatia (the dark purple) within todays modern Croatia. The island of Korčula is marked red. 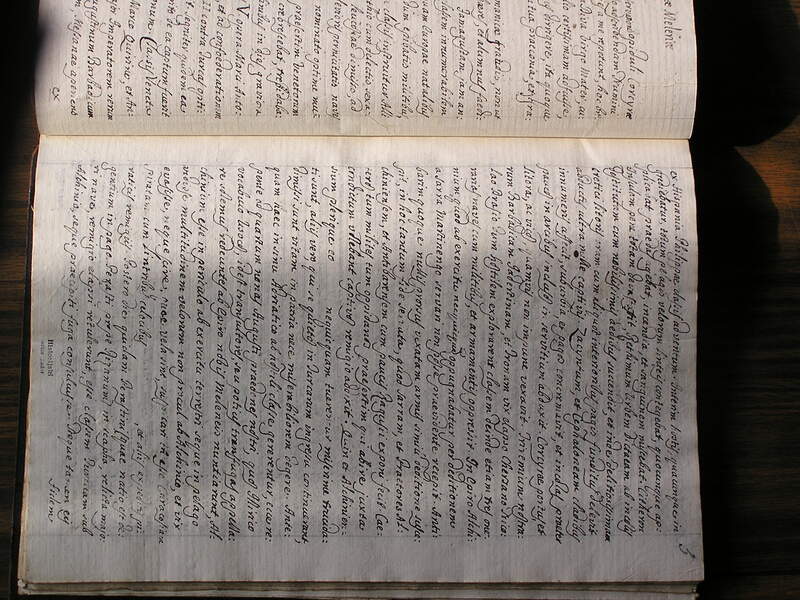 Written by Antonio (Antun) Rosanovic (or Antonio Rosaneo, Latin: Antonii Rosenei, modern Croatian: Antun Rozanović) of the historical event of the 1571 battle in which the people of the island of Korcula defended themselves against the Ottoman Empire. Originally written in Latin 'Antonii Rosanei Corcyrae Melenae Opus'. Please note: In modern Croatian the c in Korcula is pronounced ch and is written "č". Translated from Latin by Reverend Ivo Matijaca. The writing below is based on the English translation by Nikola S. Batistich. Please note chapters and images are added by the editor (not part of the original). On the insistence from those who were impressed with this successful defence of the city, my hometown, obviously with God’s help, wishing to describe this glorious happening, I have decided to satisfy that demand with this commentary. But you heavenly mother, who in those terrible moments we strongly believe that you definitely came to our help; when you then, to me, your undeserving servant, with your inspiration, guided us, please do the same now and guide me while describing this glory as well as our thankfulness, please guide my hand and my pen along the path to the truth. "Assiduis percontationibus eorum, qui conservationem opiduli Corcyrae Melenae Patriae meae miram quidem, et divino adscribendam Numini admirantes, seriem tam praeclari facinoris toties a me repetunt, hoc brevi comentariolo satisfacere decrevi. Tu tantum Diva Virgo Mater, cujus opem firma fide credimus nobis eo in praelio certissimam adfuisse, sicuti servulum non es dedignata in iis omnibus dirrigere, ita quoque manum, et calamum per veritatis semitas in tua praeconia, et gratiarum actiones precor deducito." SELIM, the tricky [originally written: perfidus meaning treacherous] Turkish emperor [Ottoman Empire] conducting a fierce war, has taken from the Venice [Republic of Venice] almost all of the island of Cyprus except for Famagusta. Confident with these successes , at the beginning of May he orders gathering of a large fleet to go against Christians, and especially against Venetians. Over here, rumours spread about this armada, and fear among people multiplied, that Turks are already approaching our borders and each day they are supposed to be getting more and more aggressive. On second day of August, unexpectedly a group of refugees sailed in, those that we called "Uskoci" [originally written: quos Illirico vocabulo Usocos ], they came from Epir and they confessed to us that Ulcinj which is about 80 miles south east of here, is in danger from land forces, and that on the sea they have seen many galleys near Ulcinj, and that they had hard time getting away from them. They were not sure who these galleys belonged to, but they suspected that these must belong to pirate Karalcozije and his cohorts. 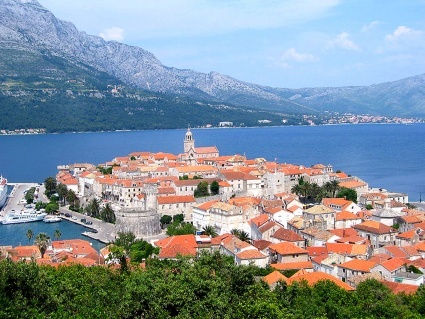 Next day another group arrived from Perast (Perast is a town in Bay of Boca) [Perasto,plus modern: Boka Kotorska or Bay of Kotor] and they confirmed the news about the Turkish fleet all around Ulcinj. And they told us how they were forced to abandon their boat and they barely survived by getting away in a dinghy. Actually this story we did not believe. What was hard to believe was that enemy’s ships have reached that far into our waters, knowing that christian navy was behind their backs. We didn’t know what to think. We were scared, everyone talked about what was to come, but no one knew for sure. People from Perast [Perasto], ones that happened to be in our town, because of these rumours, all to the last one, boarded their boats and left the town. A word came from Epidaur, that Bar already capitulated, and that Kotor [Cattaro] is in great danger of falling, also that danger is looming to all of Dalmatia [originally written: whole of Illyricum, to destruction]. Hear you respected husbands, fathers, brothers and sons, all dear in Christ, as I spoke You have heard, now by me spoken David’s thought. Think about it, I beg you, from it double powerful Gods power, from which one is a witness how to almighty God nothing is impossible, while the other shows his mercy towards us, so that; no one of us loves himself more than the love we receive from merciful God." And for sure I see myself and all of you around me, how we have all became weak. I ask you to forgive me, my dear ones, if I here appear to be magnifying this fear, but I feel that these times do not permit this to be made any worst. I also fear that we could invite God’s wrath, because of this much fear that we put on ourselves. If we in fact preach that God is merciful, if we believe that he is almighty; how then that those who in fact are against God more than against us, and we fear them more than God himself. Do we think that they are maybe stronger than God almighty? This is far from us who confess that God can do everything he wants, both in heavens and on the earth. Maybe we are afraid that God’s mercy has turned away from us? It is permissible to think about that, but under condition that no one of us loses hope in God, knowing that He is merciful and that we have to hope for his mercy. God will never forsake his mercifulness. In between God’s goodness and our lack of understanding, we by ourselves are creating barriers so that God’s help doesn’t descend on us, his undeserving servants. We have to remove this barrier, and then we will receive God’s mercy. Therefore, along with his help, it is up to us to remove this barrier. Every one of us must abandon meanness and turn towards Lord with humble heart, with confession and pennants, then Lord will turn towards us and show his great mercifulness. It is childish to cry from fear and suffering, which we deserved because of our misgivings. Our tears would be more useful, to throw away the fear, if we were prepared with clear conscience to accept either death or slavery or any other sacrifice sent to us by Lord, as penance for our sins, if we were to cry for insulting God’s goodness. We would need to first of all foresee this penalty for the sin and stay away from sin. Now, when many of us have sinned we don’t have to be afraid of cleansing, but receive God’s judgment for the good of our souls. And this is as I have said: we erred same as we now are not sinning. If we could only eliminate unbelievers, robberies, and all similar bad things. So that we don’t continue on this road, wouldn’t it be ideal if that in our hearts we don’t have any hate for anyone. Let us cleanse ourselves from any hatred and let us cry in front of our Lord, confess our sins and so that we are ready from hands of God stand to any sacrifice for the salvation of our body and soul. Now Lord himself is giving us these trials to see whether we are living up to the teachings of his only son our Lord Jesus Christ. With this, showing that we are Christians not only in name but in true conduct. One thing is for sure; all that are born on this world sooner or later, it is a given that they will also depart from this world. Doesn’t it in fact make more sense now that we have a chance to conduct our lives in the grace of merciful God, instead to waste ourselves in laziness and melancholy. We are trying so hard to be proud of our saints martyrs, but it is hard for us to follow their examples. I am familiar with the indecisiveness in all of us, but anyway I am telling you and begging all of you to be ready to suffer the torture instead to negate your belief in our Lord Jesus Christ. Because after short suffering follows eternal happiness. If we give up on our God we feel eternal suffering and terrible torture I also feel it is needless to talk about this; and I am seeing your souls without need to make you any more brave. Something else is what I actually intended to talk to you about. It seems to me that you are preparing to run away. This I don’t approve, neither do I understand by which route you are planning to run away. On the sea all around us are appearing pirates, Neretvani [Narentines ], Herzegovinians [Please note: Herzegovinians pirates as referred in the English translation by Batistich are pirates from Herceg Novi-Castelnuovo which is part of the Bay of Kotor] and other enemies that surround us. To the East already in bay of Kotor [Cattaro] is anchored all of Turkish fleet [Ottoman Empire], some 400 galleys. They may be even getting close to Dubrovnik [originally: Ragusa, part of the Republic of Ragusa] or even closer. To the West we hear that around Vis [Lissa] were spotted 10 galleys, that separated from this fleet. To the North nobody wants to receive us, and even if they take us we will become their servants and slaves. From Apulia which is to the South, we are separated by the wide sea expanse that makes it even worse, we are surrounded by enemies on all sides. Be careful so that you don’t, God forbid, run into a bigger danger by trying to run away. But if you really have made up your mind to leave ,I pray God to protect you; while I, who not any less than you likes his life, I have decided to stay here, as they say, and try my luck. I believe that enemy fleet will not go any more north past the bay of Kotor [Cattaro] or past Dubrovnik [Ragusa], since they left behind them large number of Venetian soldiers with their ships and galleys, larger and smaller, we expect that they will be joined to assist them, by Spanish and Papal fleets. I do have to admit that it can happen, that with the excuse of being our friends we get attacked by naval pirates, Neretljani [Narentines] , Herzegovinians [pirates from Herceg Novi-Castelnuovo] or Karakozije, or even some other bandits and robbers, especially if they find out that we left our city. Because of all of what I said above, I am begging all of you, especially those who haven’t lost their heads, to stay here with me, and defend our place of birth, our parents and the bones of our ancestors, same like defending God’s temples, as long as we can. ; so that we don’t let it happen that a handful of bandits clean out our abandoned city, where they could even set it on fire, this would be to our greatest shame. I am a witness that this altar to God and Virgin Mary and to Saint Bartul and Mark the evangelist, was blessed, as our fathers some time ago stood up to Aragonian ships, and inside the city walls, voluntarily closed the walls and repelled enemies attacks. Are we going to abandon that which we have received from our Grandfathers? It is far from us to be given this much of shame. But, from where are we going to find that many ships, so that all of us can be boarded? Let the crazy ones go because they will face greater dangers, than us, who are remaining here. We have nothing to fear but Gods hand from above. Even you, great ladies and mothers, I am asking you not to hold back your husbands, and talk bravely to your children. God the Creator loves you, he loves your children and this love is surpassing your motherly love, Give yourself to the Almighty, and dear God. Pray to the merciful Mother, she will ask her son for mercy, and son will show his wounds to his father, and because of these gifts that they gave, God will hear our prayers and save us from this danger. Fall down on your knees in front of our heavenly protectors Bartul and Marko. With their protection these fortified walls are standing. Humbly pray and you will be heard. Prayer will open up the heaven, is calling God, it is disbanding armies, the mean ones are made smaller, but the modest and good ones are made stronger and more brave. After these words we continued with our services, and we brought it to the ending. The public started to whisper and talk to one another. Among them, some were fond to superstitions, or maybe by nature were hiding the worries of the public, mentioning some yellow birds, the species that was never seen in our parts, those days in our channel between Orebic [Sabbioncello, modern: Pelješac Channel or Pelisac] and here were seen in numbers, where they at times swim on the sea surface, and other times fly over the island, where they are damaging the vineyards. Someone said that they came from the Black Sea, and that they are preceeding the Turkish fleet, or that they are signaling turks in white turbans that will arrive here to destroy us. Some of the richer people already started carrying their boxes to the boats, as some people coming from Dubrovnik [Ragusa] are talking of very bad news, one after another. And so everyone got excited, carrying their belongings to the boats, with such a rush that they were bumping into one another at the city gate. City Rector was a young man, very inexperienced, and had no trust in experienced elders. It has been only two months since he assumed running of the city and in this short period did not gain any liking among citizenry. Anyway, these last few days he showed to be softer and more understanding. Seeing how everything from the city is being carried out, he gave an order to at once securely shut the city gates. Then many stopped lowering their belongings over the city walls, and some of them in front of the city gate started to pile up things, pushing one another. This was a very sad scene. This is how Troy looked when it fell in hands of the enemy. Rector did not take much of his clothing, because he had left his family back in Venice. But anyway, his servant-lady along with most of his other belongings brought down to the quay and placed in the boat. In addition he secured for him a pirate ship from Perast [Perasto], which was very well maintained. It had six strong rowers, and he rented it out for 120 golden ducats. At dusk we were hearing all kinds of conflicting news reports. Frightened women were running through the city, begging to be let on the ships or to run into the forests. In the evening, Rector agrees to let them go, this he repeated the next day even more, he ordered the city gates to be open, so they can transfer their belongings to the boats that stayed anchored. Finally those who wished to leave, raised their sails and sailed away on 8th of August. We must tell you what has happened when the Franciscan brothers left. Actually both orders, Franciscans and Dominicans, even a few days earlier, before anyone else ran away. They actually, from their monastery at island of Badia [Scolenum sancti Petri], two miles East of the city, earlier moved their miraculous cross and five paintings of Blessed Virgin. They secured these in Church of All Saints, inside the city walls, than later before their leaving, they pulled a precious picture of Our Lady, with all it’s jewellery and decorations and placed it in the boat with which they intended to leave. The miraculous cross, because of the size of the boat they left in the church. Then all of a sudden a big storm started. The waves were coming up from the bottom of the sea toward the sky, with the wind it seemed as all the water mixed with air were going up to the sky. Later, we found out that during this storm at port of Ulcinj seven Turkish galleys were smashed and sunk. Number of others collided with one another. Worried monks, by being scared, thinking that God sent this storm to punish them, immediately returned the picture of Virgin back to the place from where they removed it. After the storm had passed they left the monastery and bells in the bell-tower, and everything else that they possessed, then ran away leaving those sacral objects in the city’s church. That strong wish for survival and life, made them not care for their spiritual promise. They were so united in leaving that even their servants left with them. We have to be fearful of their example, because some of them lost their lives, other had to be rescued with expensive ransoms paid to Neretljani [Narantani]. Next day, after these escapes, two monk impersonators showed up, saying that they came form another Province, and they would like to carry away the paintings of Our Lady. We then chased them away. We told them that they should be ashamed of themselves, if it is possible for them to feel any shame. I am mentioning this along the way, then I am continuing the description of happenings. Our (escapees that were traveling on their own) all of them alive and in good condition arrived at Hvar [Lesina] (town on the next island some 25 miles to the North West), day after, they made it to Zadar [Zara], since they were followed by favourable winds. People in Zadar [Zara] being surprised seeing so many of our and Hvar's [Lesina] sails, got also worried that the enemy was coming towards them. Back home, we kept watch by day and by night, we were managing without anyone’s help. Sadly, even our neighbours cut all contacts with us, like if we had some kind of disease spreading, or like a curse was put on us from the sea and fire. This lasted for some twenty days. Only occasionally, from the opposite shore, secretly a small row boat would arrive with some letters and news. Then it was announced on the August 9th in the bay of Zuljana (about 8 miles to the East), that there are seven small galleys, they took prisoner priest Franjo Ordonicich with some other travellers who were heading for Dubrovnik [Ragusa]. Zuljana is a small village on the South shore of Peljesac [Sabbioncello or Pelisac] peninsula, opposite island of Mljet [Meleda]. Following night these Herzegovinians [pirates from Herceg Novi-Castelnuovo] were sailing close to our island along the Southern shore to the outside.In the quietness of the night they landed close to Blato [Blatta], in a bay called Grscica [Giči], then early next morning three platoons of pirates coming from the South reached the village of Blato [Blatta], up to that point not being noticed; until a scream of a sentry signified coming of the enemy. Even though the sentries on the whole island were notified of the coming of Herzegovinians [pirates from Herceg Novi-Castelnuovo] to Zuljana on the opposite coast, fell asleep without noticing their coming. When they noticed the enemy coming, they turned their backs and ran away into the darkness of the forest. They were wrong in falling asleep, but were very good at screaming. At this noise, anyone who heard it, ran away in all directions. The bandits set their positions as follows; first one stopped at the hill in three platoons of men arranged their position in the direction from where they came, second one was already at work, stealing and plundering of nearby homes while the third one reached the centre of the village with full battle gear, as a security force to protect the stealers and robbers. Blato [Blatta] is the largest village on the island, which can in need produce about 300 selected defensive fighters. 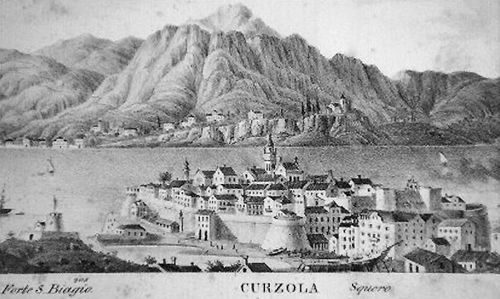 One part of that force then was called to Korčula [Curzola] to help with the defence of the city, another group was forced to go in service on Venetian galleys, while the rest was hiding in the forests leaving homes unprotected. As a result, these bandits succeeded in robbing the whole village and taking about 50 people as prisoners. These were all children and women, with the exception of Simon Simonetti and another three old people, with one of them being completely blind. Three ladies, they let go, then they also released three wounded men, another man named Pelegrin Krsinich hid on top of a tall almond tree, he was wounded with arrows, but anyway survived. Nikola Kastropil [Castropil], was taken prisoner inside his house, was able to escape swinging the chains where he wounded three of the enemy, himself was lightly wounded. Third man Ivan Barcot , who survived by running away, while running he heard screams from his mother, then looking in the direction of the scream, he could see where the enemy soldier was dragging her by her uncombed hair. Thinking of his motherly love, he charged toward the enemy, then kills four of them, frees his mother from the chains and helps her escape to a nearby forest. And while he was fighting with one enemy, more of them were coming toward him, not being able to free his spear tangled up in enemies clothing, he was then wounded, after two days he died of these wounds. It was with luck what he accomplished, heroically saving his saddened mother. There was a report that enemy accomplished two human deeds. First because they saved life of Peter Petric and his wife, where they laid in the bed In extreme poverty, unable to move. This man was brother of priest Ivan, who was in service of church in Padova, and his father Ivan Petric was employed as a secretary to Ferata Gonzaga of Milano. Another one of the enemy also showed good deed by taking an 8 days old baby and quietly handed it over to the relatives to take the baby to the mother. When the word spread in Korčula [Curzola] of what has happened in Blato [Blatta], people were taken by general sadness. Then they were all confused, namely all of the people from villages decided to leave with the excuse to check on their families left behind, and to find out what if anything was left saved after the enemy departed. Then appeared some holy man who was supposed to foresee the future, he was carrying a gun, had a sword and a spear, he definitely seemed not to be all there mentally, saying that his only calling was to criticise the public. That same night as well as the next one those that were manning guard-posts alarmed the city, because they thought that they were seeing through heavy rain and rising sea waves how from the direction of Orsan in easterly direction there appeared a large ship, heading in this direction. We, thinking that these maybe are the ships belonging to those that devastated Blato [Blatta], where they were joining those galleys from the bay of Zuljana, we opened fire from our cannons in their direction. Later we found out that these were Herzegovinian [pirates from Herceg Novi-Castelnuovo] boats moving during the night along the opposite shore of Peljesac [Sabbioncello or Pelisac] , and that they stole anchors and ropes than let these boats loose, where waves carried these closer to our shore. This was why we got scared, for no reason. That same night two unpleasant things happened. First that the guards of the fortress called Ravelin, left their posts because of the rain. When called to explain, they said “How could we remain there, when water was reaching up to our knees”. On that Archdeacon stepped in the water, and by moving one stone that was blocking the drain, whole area in a moment became dry. Other unpleasant thing was that, firing only one cannonball from behind the church of All Saints, wooden horse supporting the cannon broke, than at the asking of the Archdeacon ship-carpenters Nikola Misulic and Franjo Paulis (DePolo) fixed it in four hours of work, while Archdeacon provided the light by holding a candle. 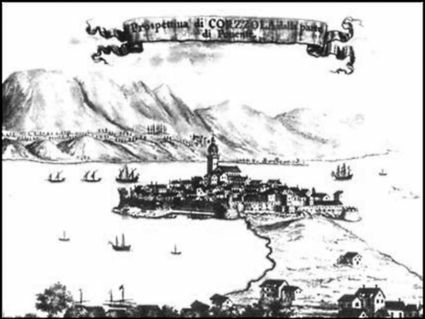 Around thirteenth of August we received news from Dubrovnik [Ragusa] that Ulcinj had fallen in hands of the enemy, as well as Budva and Bar and that Kotor [Cattaro] is surrounded both from the sea and from the land, so that people of Kotor [Cattaro] are in extreme danger. It is our general opinion that Kotor [Cattaro] can be taken with smaller number of vessels. 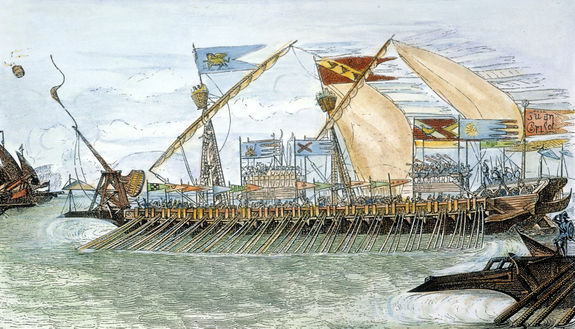 Then the rest of their fleet can be used to attack and take over most of the costal towns along the Dalmatian coast, especially Zadar [Zara] and Šibenik [Sebenico ,originally written: maritimarum civitatum totius Illyrici praesertim Jadrae, et Sibenici]. This news carrier also brought a letter from Antun Paladin, forwarded to Filip Rozanovic, written in plain Italian language, poorly composed, in which he is letting him know that he is located with the Turkish ships in Dubrovnik [Ragusa] and he is hoping to find there one from the Rozanovic family. Since he didn’t find anyone, his wish was to write this letter, to say hello to his relatives in Korčula [Curzola], especially his brother and offer himself ready to help in any way he can. It was signed “Jusuf”, as he was called by the Turks. Paladins are in our town an old and respected family belonging to towns nobility. At one time they were very wealthy, but recently they fell into poverty, like many others and moved to Zrnovo [Zernova], a village close to the city. From this family comes Father Vicko, well known theologist, Dominicans brother and big friend of Archdeacon, related to him four generations back. Because of this relationship Rozanovic’s took in initially Jakov, who died very young at 10 years of age, then his brother Antun, they were both Marko’s sons, who were left without parents, so they brought them up. Since he was a child Antun was told that he should become a sailor. After a shipwreck he experienced near a Greek island of Hios, he fell in the hands of barbarians and as prisoner of Uluz Ali, also called Occialino who was vice king of Algiers (some think that he comes from the town of Julie Cesarea). Antun was then forced to accept Turkish citizenship, and he was given the command of one of their galleys. This is how Marko Prasica handed the letter to Archdeacon instead of to Filip, who is ill, in sad condition and who with some others ran away to Zadar [Zara]. With the letter there was attached six rolls of white silk thread, with unknown value, I believe as a symbol of something not known to me. With all this happening, among us fear increased, our Rector openly and without pretending was saying that the city has to be abandoned, instead of sitting and waiting for the enemy who greatly outnumbers us. Archdeacon instead told everyone to be brave, he was using the friendly letter from Antun Paladin with that thread of white silk as a symbol of security and peace, while others explained it, that the thread means chains and that letter did not foresee any hope, and they continued to be very worried. Following this, people were called to the prayer, which we did as often as possible. The priests were asking for God’s mercy and help from the Saints, while most people with tears in their eyes were answering the prayers. There was three masses held so that public would be preoccupied, and would not think of dangers approaching. After the services in the Cathedral of Saint Marko and while people were going over to church of Holy Trinity, where another services were being held, over here arrived from Peljesac [Sabbioncello or Pelisac] a nobleman from Dubrovnik [Ragusa] named Helije Cervin Bunicevic, whom Rector after leaving services takes to his palace. There they conducted a lengthy talk. Rector stayed at his palace and Helije returned back to Pelješac [Sabbioncello or Pelisac]. When he was leaving Vicko Rozanovic asked him of coming dangers. He answered with a smile “everything will be fine if Rector leaves town”. After the Mass in a procession around the city, after hearing the third Mass in front of the picture of the miraculous Virgin Mary. There it happened that one of ours, possibly from exhaustion as well as of fear of the approaching enemy, collapsed unconscious, and was taken home where he laid appearing dead for three to four hours. As a result of all of this, three days later, as the enemy was nearing, he was among the first ones to ran away from the city and did not stop until he reached a distance of some fifteen thousand steps. After the services we had refreshments. Vicko Rozanovic told his brother what he found out, from talk to Cervin Bunicevic. Archdeacon knowing how among public the fear is multiplying, became very sad and worried himself. At the courtyard of Rectors palace he encountered arguments, this was about stocks of city grain, where some were demanding free passing of food, which was customary in the past, for soldiers-defenders. The argument was between Rector and few of our people; Rector not wanting to give any food, and others were saying that it is not possible to survive inside the city walls. Especially peasants were demanding help. Archdeacon approached and started acting as a judge. He took Rector on side and asked him. What does he think about leaving the city. Whether to run away or try the luck by staying. He answered that he will run away if we get attacked by a large force. Archdeacon will then; "Who are you going to leave all this food, maybe to the enemy?" "It would be better that before you leave you see around you people with full stomachs." Rector after all this agreed to distribute few buckets of grain, but ordered to keep records of to whom the food was given, so that later they could be charged for it, because he was worried that just free distribution may not be acceptable to the Great Venetian Senate. This arrangement was acceptable and everyone was busy passing around the food. After that Archdeacon spent three hours talking to Rector, asking him not to leave the city, even if everyone else leaves. Rector told Archdeacon, that he suspected he himself was secretly planning to escape, showing him a boat at the quay loaded with three barrels of wine and some other articles. This was not done planning to run away, because this boat is very heavy and very slow, but he did this to help his brother Filip and those who left with him, because they could not prepare this by themselves. It is also impossible to resist the force of eight galleys, with the small number of defenders and with weak fortifications. Right after this he ordered, in front of Rectors eyes to empty the boat and then to sink it. Following all this, he personally inspected all men, counting them, where he found some 240, excepting women and children. Rector changes his mind, then Archdeacon started protesting and naming everyone to different fighting locations, then assigned commanders to each location. At the same time on a fast boat arrived several men from Hvar [Lesina], asking for their community several barrels of gun powder. To this, many reacted strongly being led by Jeronim Gabrielis. While Archdeacon suggested to let them have the powder, knowing that our supplies are plentiful, and in addition we have powder that was supposed to be sent to Ulcinj. And so, our days were passing in extreme excitement and nights in sleeplessness. In the meantime we were constantly receiving news of damages done by Neretljani [Narantani] and even by our neighbours from Peljesac [Sabbioncello or Pelisac], then about the troubles from all sides. From all directions all we could see is danger. From nowhere we could see any hope of survival. Instead we had to lean on our Savior and blessed Virgin as well as on heavenly saints, towards whom we turned all our prayers for unending assistance. We were all occupied around the altar; priests rising, husbands kneeling, elderly sobbing, young ladies with unfurled hair, women crying, children screaming, all of public were depressed with fear, uncertainty and bitterness. It happens in the meantime that a certain elderly lady approached Archdeacon and said; "I will reveal to you a dream that I had seen last night ; I dreamt that I am kneeling in front of Virgin Mary, I was praying and asking her to protect this city. She answered to me. I will provide protection, but tell Archdeacon to be brave, and not to give up." She was trying to say some other things , but Archdeacon cut her off with words; (fearing that there may be some trick in all of this). Granny, time is not to listen to somebody’s dreams, because I am not really worthy of that. Hurry up and pray to God. While saying this, he moved on, telling her to be quiet. We were betrayed, really betrayed, they are digging an opening on new Rectors fortress, they screened themselves so they could not be seen. After that, when darkness comes Rector will run away with his group. What if anything did Marko Prasica bring new from Dubrovnik [originally: Ragusa], even though he already knew all about it, because he told everyone that he brought the letter, how there was 80 galleys guarding the island of Rod, then they are coming here to destroy us. And that along the way were seen many sails near Dubrovnik [Ragusa], and that by tomorrow they can be already here. This is why this Jakov from his office was climbing the fortresses to see if any sails are approaching on the horizon. Archdeacon joined him, This was a chance for them to enter into a lengthy conversation. Jakov started, without making any sense to respond to questions. Archdeacon pretended to believe everything that he said. Together they climbed up on city walls, and continued walking all around the city on top of defence walls. Finally when they reached wooden steps at Southern City gate, Archdeacon said; Look brother; do you think I don’t know about the news we have received; I know of 80 enemy’s sails, because of this you came out from your office, to see them coming; I am familiar with the open hole cut in the city’s walls by the Rectors palace, I also know that as soon as it gets dark you with Rector plan to leave with that hired boat from Perast [Perasto], which is already docked here at the quay. Even though I knew all this I am not mad at you, or that you have tried to lie to me. In fact, because I know your faithfulness to Rector, I respect that, and I am discovering that you enjoy this relationship. In the name of this opinion of mine, I like you to transmit to Rector that not only me but all of the city’s citizenry, know the news and the consequences of his decisions. Therefore we pray that he doesn’t leave the city, in no way, especially not secretly. By swearing himself, archdeacon answers, that he is doing this because of his and Rectors salvation. Thinking about all of this, he lowered his eyes to the ground, all he is going to do is to tell this to the Rector. At the time they parted the Rectors palace became open to everyone. Looking for Archdeacon and bringing him inside where Rector was, together they shared sorrow of their sad situation. Rector asked him to accept his position. Archdeacon answers, that he has no reason to abandon his stand, than he brings in the letter received from Dubrovnik [Ragusa], and that the message in the letter can only make you more brave knowing that coming ships will do their planned activity. That the naval armada is approaching our shores, coming from Rod, says Rector. On that Archdeacon answered;” but perhaps we are safer inside stone fortifications than are enemy inside wooden boats”. What would you want them to throw rocks at me?
" We will be more successful and it will be more beneficial to our country if on this trip goes only Rector, instead of someone else, who could with the excuse of being an emissary, take a chance of running away from us, Dodge’s goal is to protect this city. But if Rector who is his representative considers anyone traitor who stops the Dodge in helping his people." Your honour Rector, it is not proper during the time of your being away, to leave this city without the leader. I trust in you to lead all of this island. I would like you to know your honour, that his eminency bishop, as well as his vicar with almost all of the clergy left this town. That to me, although I consider myself undeserving, handed over spiritual responsibilities for this city. And if I would accept this responsibility, I don’t know if I can be successful in conducting these duties. I am not running away from this heavy load and I am not running away from this responsibility. Quite to the contrary, I am ready for everything, and I am also suggesting that four men should be selected in the city; namely three nobleman and one citizen, stopping this troublemaker from continuing causing all the problems. Rector accepts Archdeacons suggestions, except the one regarding that troublemaker. Four were named; Ivan Batista Rosanovic, Jerolim Gabrielis, Marin Obradic and Antun Kosta the stonecutter. The keys to the city gates were given then to the oldest, Ivan Batista Rosanovic. Completing this, about one o’clock in the morning, through the city gates on the sea side, together with his close ones Jakov and Marin Rector boards the boat belonging to Perastans, dressed in plain sailors outfit he departs to Hvar [Lesina] then Zadar [Zara] and finally Venice. In the meantime all of us were hoping for something better, we patched those holes cut into the city walls by the Rectors palace. We have positioned all of our guards on the walls, we also inspected all of these positions, and where it was needed we have strengthened them. There is really no one around except for some elderly people, be it on top of the walls or on the streets or even in the churches. Everyone was resting to be prepared on the first call to assume their duties and positions as soon as need be. Archdeacon then headed to his house, just before dawn, to get a short rest. He got less than one hour of sleep because morning bells of Matutine woke him. ^ The Narentines, who are referred to today mainly as Neretljani, were a nation of Slav pirates. Also known as Arentanoi. By the time of this battle they where just privateers in the services of the Ottomans. In 1571 the Narentines no longer had a state and where a small group of pirates from the neighboring river Neretva. ^ Editors note: According to some sources the settlement of Sibenik was established by Croatian Slavs in the 11th century, and was given its name, Šibenik (the Š is pronounced sh ) The term Slav was first used by the Byzantines (i.e. Procopius-Byzantine scholar, Jordanes- 6th century Roman bureaucrat) and was recorded in the 6th century (cia. 550) in Greek (Σκλαβῖνοι-Sklabenoi). Later in Latin it was written Sclaveni. Slavic tribes invaded the region of Roman Dalmatia in the early Middle Ages. Prior to the arrival of the Slavs, Roman Dalmatia was mainly inhabited by a Roman Latin-Illyrian population. Šibenik was latter renamed Sebenico when in 1412 the city became part of the Republic of Venice (1412-1797). Its name was change to Šibenik by the Yugoslav regime in 1920. This page was last modified on 15 December 2018, at 07:30. This page has been accessed 12,189 times.